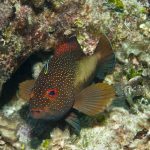 Reef fish, as predators or grazers, play an important role in the community dynamics of coral reefs. Coral reefs with intact fish populations and trophic linkages are integral to healthy reefs. We study the abundance, size and distribution of fish populations to understand changes in reef dynamics and help understand how humans affect fish populations through activities such as fishing and habitat modification. The purpose is to count and quantify the abundance and community composition of key fish species along 30-m long × 2-m wide belt transects and measure the relief of the reef. Fish teams should survey a total of 10 transects/site; more are acceptable. Coral reef fish come in a variety of shapes and colors. We focus our surveys on key indicator species – those fish or families of fish that play key ecological roles on coral reefs and on vulnerable species – those fish susceptible to fishing effects or vulnerability to aquarium-trade. We collect both fish count and size data. Fish abundance is a count of the number of fish in a given area and can be calculated in terms of total fish abundance or in terms of abundance of key fish species or families. Abundance is presented as numbers of fish per unit area or when combined with size data, calculated in terms of fish biomass (total weight of fish per unit area). Total fish biomass gives important information about trophic structure and overall reproductive output of fish on the reef. Commercial fish biomass gives an indication of overall stock status, fishing pressure, habitat conditions, and recruitment success. What is the most common reef fish we have seen? Striped Parrotfish (Scarus iseri) are the most counted fish species we have observed. Fish in the parrotfish, surgeonfish and grunt families have been seen most often. Coral reefs provide habitat for fish and other reef organisms. The structural relief is a measure of a coral reef’s vertical height and is a proxy for reef complexity (holes and crevices). Reefs with higher relief and/or complexity often provide more habitat for of fish and reef biota. Herbivorous fish are a key indicator group as they are important grazers that keep algae from overgrowing corals. Large-sized parrotfish (>20cm) remove more algae. Parrotfish are at high risk of over exploitation due to fishing. Groupers and snappers are key predators on coral reefs. Large-sized groupers of at least 50 cm+ are needed to produce more offspring.